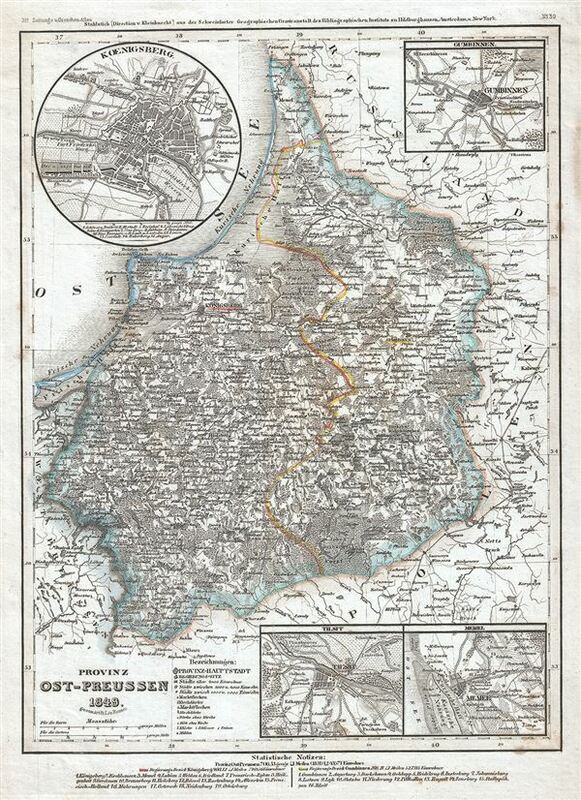 This is an uncommon example of Joseph Meyer's 1849 map of the province of East-Prussia, Poland. It covers from Klaipeda to Elblag. Throughout the map identifies various cities, towns, rivers and an assortment of additional topographical details. Includes four insets of Kaliningrad (Koenigsberg), Klaipeda (Memel), Tilsit and Gumbinnen. The provinces of East and West Prussia were created in 1773 following the first partition of Poland. The two provinces would later be joined in 1829 to the United Province of Prussia, until in 1878 they would once again be split into the provinces of East Prussia and West Prussia. This map was issued as plate no. 39 in Meyer's Zeitung Atlas. Although all the maps in this atlas are not individually dated, the title page and maps were often updated while the imprint with the date was not, causing confusion to the exact date for some of the maps. Moreover some maps in the atlas were taped in at a later date as an update to the atlas. We have dated the maps in this collection to the best of our ability. Very good. Minor toning and spotting at places. Dampstains over left and right margins.